First Line: Life is full of surprises. Although some folks may think she's crazy, Della Wright couldn't resist buying a very big antique Irish loom for her shop, Dream Weaver. She may have been a bit psychic, since celebrity designer Bunny Boyd comes into her shop, inspects the place and the merchandise, and puts in a huge custom fabric order for her latest project. Bunny is refurbishing millionaire Bernard Whitby's mansion there in Briar Hollow, North Carolina, and that fabric order could mean guaranteed survival for Della's fledgling business-- especially since Whitby has just announced his candidacy for governor. But all the buzz surrounding the announcement is cut short when a local coffee shop owner is murdered. With one of her friends on the suspect list, Della knows she must do a little investigating on her own. My enjoyment of the cozy Weaving series continues with this second book (after Looming Murder). There's just enough information about weaving to make the crafty part of me happy, and the mystery kept me engaged throughout by way of a long suspect list and some excellent misdirection. But-- like any cozy mystery worth its salt-- it's the characters who make or break a book, and author Carol Ann Martin has created a winning cast. Della's friends are a diverse group, and I like how they've all banded together, not only in friendship, but in the quest to earn a living through their artistry. Della's romantic yearnings for Matthew in conjunction with the matchmaking manipulations of their mothers adds zest and humor to the book. 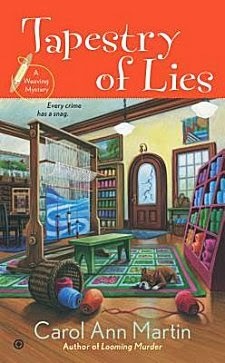 Carol Ann Martin's Weaving mystery series is rapidly becoming one of my favorites-- light, fun reads to curl up with in the afternoon! Cathy - I've always been fascinated with weaving even though I can't weave, myself. It's such an integral part of so many cultures. And it sounds as though this series, well, weaves that in. Thanks for sharing and I'm glad you enjoyed this. Same here, Margot. I couldn't weave if my life depended on it, but it's always fascinated me. Enjoyed your review. That is a big, big loom. Yes, it is huge, and I hope Della gets to use it in future books. Glad you enjoyed the review!